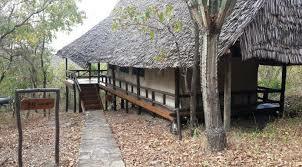 Vuma Hill Tented Camp: 16 tents comfortable furnished comfortable & specious room with old fashioned colonial décor with en suite bathroom facilities & shaded wooden veranda at the front. Sleeping under canvas at Vuma is a far cry from the discomfort usually associated with camps. Complete at the back there is not much more to be asked for. There is ramped access to the main areas, swimming pool.